An electric circuit in which the elements, branches (elements in series), or components are connected between two points with one of the two ends of each component connected to each point. 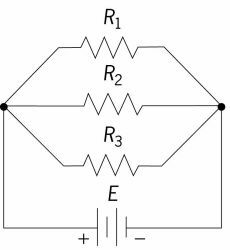 The illustration shows a simple parallel circuit. In more complicated electric networks one or more branches of the network may be made up of various combinations of series or series-parallel elements. In a parallel circuit the potential difference (voltage) across each component is the same. However, the current through each branch of the parallel circuit may be different. For example, the lights and outlets in a house are connected in parallel so that each load will have the same voltage (120 volts) but each load may draw a different current (0.5 ampere in a 60-watt lamp and 10 amperes in a toaster). An electric circuit in which the elements, branches (having elements in series), or components are connected between two points, with one of the two ends of each component connected to each point.